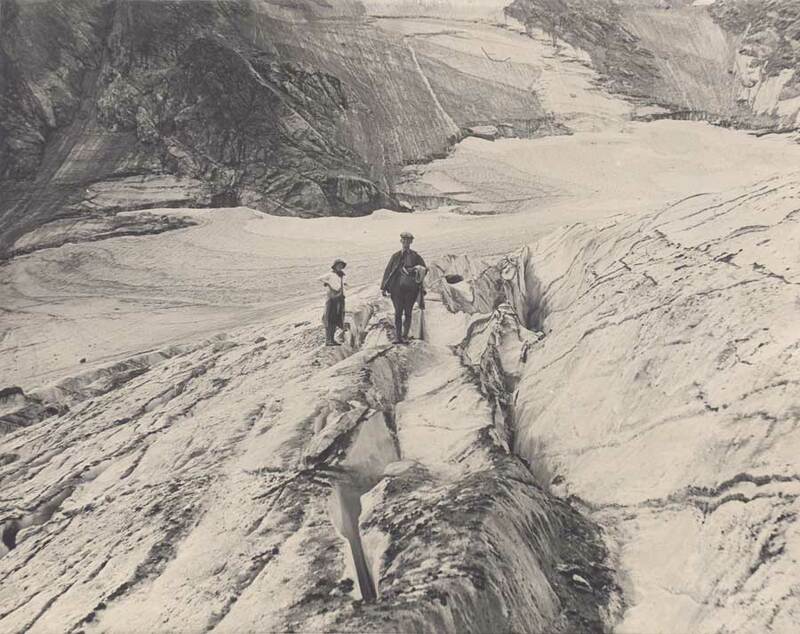 Two photos above: Junius Henderson, founder of CU’s natural-history museum, studied the Arapaho Glacier for years and took these early photos. Although people once hiked and picnicked on the glacier, it’s been closed to the public since 1920. (Photos by Junius Henderson. From the Glacier Photograph Collection, Boulder, Colorado, USA: National Snow and Ice Data Center, digital media. 14, 1900, Boulder pharmacist Eben G. Fine was in the mountains west of town, visiting the owner of a mine in the vicinity of Silver Lake, the lowest and largest in a string of glistening alpine lakes tucked into the upper reaches of North Boulder Creek. Full of adventure on what was likely a hot summer day, Fine set out on a hike toward the Continental Divide. 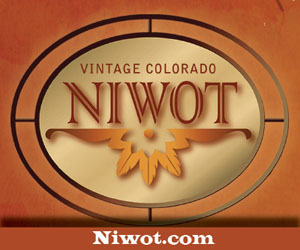 His route crossed what Boulder residents called “the big snowbank,” a large white patch on the eastern side of North Arapaho Peak that was visible from several parts of town, according to Boulder’s Waterworks: Past & Present by Silvia Pettem and Carol Ellinghouse. 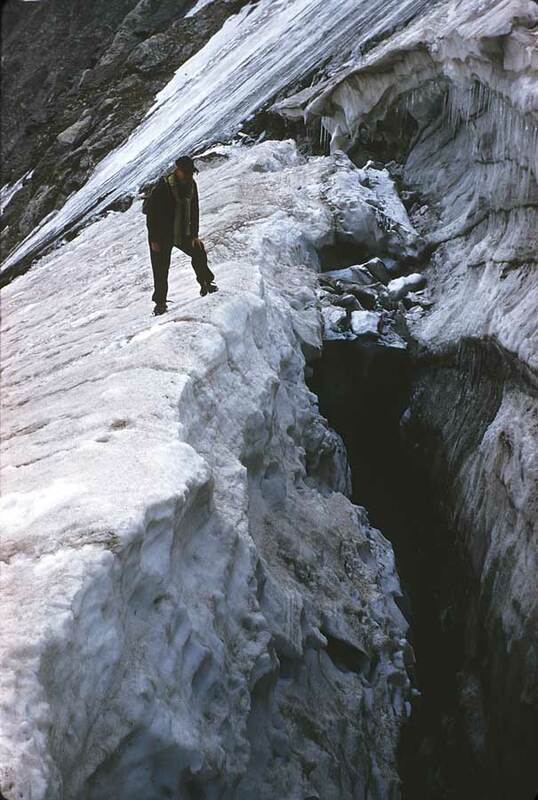 As Fine crossed the patch, he quickly realized that he was standing not on snow, but on ice—the compressed, blue-tinted ice characteristic of glaciers. Startled by his discovery, Fine nearly fell into a crevasse, one of the deep cracks created as a glacier slowly flows downhill under the force of gravity and its own weight. 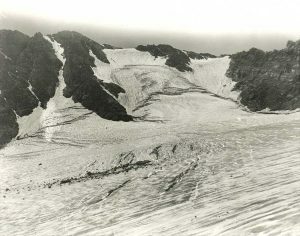 Although his claim of discovery was soon disputed, Pettem and Ellinghouse write, the glacier’s significance was not lost on city planners. Because glaciers form where snow accumulates at a faster rate than it disappears over centuries, or even millennia, they are frozen storehouses of fresh water—a vital resource on Colorado’s parched plains. The story of Boulder’s water supply is integral to its history. Less than a year after the first gold-seekers set up camp near Boulder Creek in 1858, the first irrigation ditches were flowing across what’s now Boulder County. By the 1870s, the city realized that it would need storage in order to provide a dependable, year-round supply of water for its residents. So it built its first reservoir just south of the Red Rocks in Settlers Park, according to the city’s BASIN website. After the discovery of what became known as Arapaho Glacier, Boulder began acquiring lands specifically to protect its water supply—long before the practice became common. In 1904, Boulder bought some private acreage along North Boulder Creek, in what has since become known as the Silver Lake Watershed. However, most of the roughly 6,500 acres that the city now owns in that watershed was purchased directly from the federal government, after the U.S. Congress deeded the land to Boulder for the express purpose of enhancing its water supply. In 1927, the third and final federal land grant, which included Arapaho Glacier and four peaks along the Continental Divide, ultimately secured the integrity of the watershed, which today provides 40 percent of Boulder’s water. Another 40 percent comes from Middle Boulder Creek via Barker Reservoir near Nederland, and the final 20 percent comes from Colorado’s Western Slope by way of the Colorado-Big Thompson diversion. The Arapaho Glacier remains an important source of water for the city, according to the BASIN website, but the vast majority of the city’s supply comes from annual snowmelt rather than the glacier itself, says Kim Hutton, a water resources engineer for the City of Boulder. This is fortunate because the warming climate poses a severe threat to the Arapaho as well as several smaller glaciers located within Boulder’s watershed, including the Arikaree Glacier, which is located about 2 miles farther north. Crevasse photo by Henry Waldrop. From the Glacier Photograph Collection, Boulder, Colorado, USA: National Snow and Ice Data Center, digital media. According to a scientific study published last year in the journal Plant Ecology & Diversity, the Arikaree’s mass has declined markedly during the last 12 years, after holding steady for 30 years. Mark Williams, a fellow at CU’s Institute of Arctic and Alpine Research and a co-author on the study, says the glacier is likely to melt away completely within about 25 years. The larger Arapaho Glacier is also declining rapidly. During the 20th century, it lost 52 percent of its area and also thinned significantly, says Ted Scambos, a senior research scientist at the National Snow and Ice Data Center at CU and a co-author on a 2010 ground-penetrating radar study of the Arapaho. If recent trends continue, this ice—a vital part of Boulder’s history—is predicted to vanish by 2075, if not sooner. Back in the early 1900s, many locals enjoyed the novelty of skiing, hiking and even picnicking on the Arapaho Glacier. But after a cholera outbreak, the city fenced off the area in 1920, and it has remained closed to the public ever since. 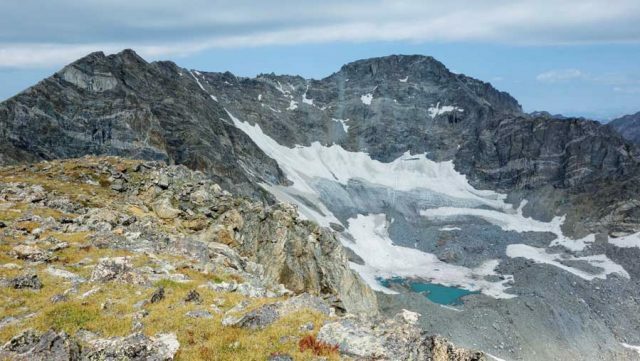 Since it’s not possible to visit the watershed, the best way to see the Arapaho Glacier is either by strolling up the 0.5-mile-long trail to the top of Sugarloaf Mountain, accessed from CO 119 via Sugarloaf Road, or by hiking 6 miles (one-way) to a fantastic overlook of the glacier along the more strenuous Arapaho Glacier Trail, which is accessed from the Fourth of July Trailhead west of the town of Eldora. You can also see it from a distance east of town. Terri Cook is a Boulder-based science and travel writer whose career has focused on exploring and explaining the history of our amazing planet. 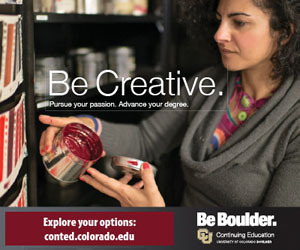 She is the co-author of three books, including Geology Underfoot Along Colorado’s Front Range. Follow her adventures at @GeoTravelTerri or www.down2earthscience.com.